The MOVI App provides you with a quick way of finding new and old movies by randomly choosing for you. If you are one of those who are tired of searching for great movies, this app is for you! 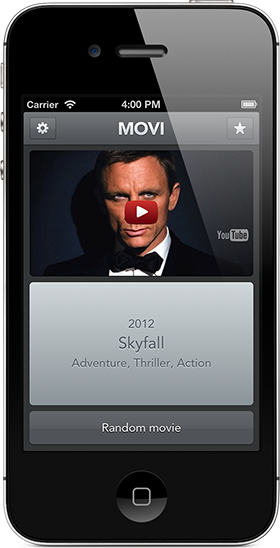 You can watch trailers and quickly navigate to more information about each movie from e.g. IMDB, YouTube and Google. If you want movies from only certain genres and or years, The MOVI App of course helps with even that. The MOVI App is available in English, German, French, Italian, Spanish, Swedish, Danish and Norwegian. Do not forget to follow us on Twitter, Facebook and Instagram. You can contact us at hello@movi-app.com.